Does anyone use this app? I would like to know some review of it before download. Looks promising but a bit of work still - hope you get custom Last.fm logins (so personal last.fm history is incorporated) and Tidal support asap! Any estimated date for updates ? milleph wrote: Mono now has significantly improved Subsonic support - we've added what should have been there from the beginning. Search by artist, track, album, load playlists etc. Let us know what you think and what else you'd like to see. Seems to be missing offline-saving. Without that feature I personally would never use an app. I'm currently using dsub and I'm quite happy with it, although I only sync my playlists and play my music with it, so I don't use any fancy features. Looks nice tho! I like the idea of this app but I think there's a long way to go and I think maybe a desktop/webserver kind of approach might be better suited. These days listening to music I get one song of Subsonic, one song off Youtube, next maybe Soundcloud .... so it would be GREAT if you could integrate these into one search and one interface, with Subsonic as the solid backbone of course. But a very complex job I think. Since very few songs are not on Youtube I would prioritise ability to create play queue seamlessly mixing sources eg SS and YT. - assuming you just want to login to your account and have Tidal available as a source? - should this be arbitrarily extensible or is a fixed maximum of servers (say 3) enough? - assuming search/lookup should extend across all servers? We just released a new version that solved some of the SSL issues we were having with Subsonic/Madsonic and sorted out Notifications for local and Chromecast playback (they were a mess). To be honest I rarely login directly to Last.FM so I'm probably not the best to suggest what to use Last.FM for. But I see it almost universally incorporated in music software I use so I imagine it's solid and has many uses. Regardless I imagine there are very many interesting uses that can be thought up from a register of all your music listening and all the patterns in frequency etc. YES! That would be fantastic, if I could have a music player where I could browse my private local music files alongside the Tidal library. Like they all appeared as part of one directory tree, with for example a different colour denoting local and Tidal sources. And Youtube then as a fall-back last-priority source if you searched for a track that you don't have elsewhere in your library sources. That might not even be possible from Tidal though, to basically get and browse a list of everything that is there, I don't know. ES File Explorer can also browse several sources like this but ES File Expl doesn't handle the on-the-fly playlist very well or with stability. With a combination of cloud/local/work-whatever accounts it is SO USEFUL (and there is no reason not to) that you can browse essentially identical but technically different sources such as C:\ and e.g. and SFTP from your NAS to e.g. drag and drop into Winamp when you're listening to music. Great feedback - appreciate it. We are going to work on caching Subsonic files next and we hear you on the folder interface. 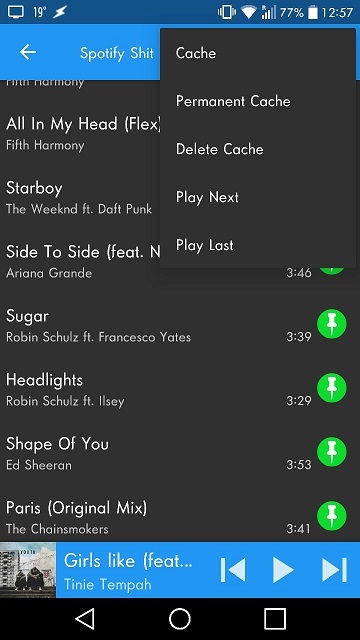 - To build a playlist from tracks from other playlists, send each chosen track to the clipboard from the track menu. Edit: Something else that would be nice is background playing for YouTube videos. Now sure how much this depends on the YouTube app, but I'd like to play a video and still mess around in the app, outside the app, and turn off my display. Edit2: Found a little bug. When playing something from my subsonic list, switching over to chromecast isn't working. It does connect with the chromecast, but doesn't switch playing on the chromecast and instead continues playing on the phone. Pausing isn't working either, so I have to force close the app. Connecting to the CC first, then playing a song works fine. FlyingPersian, thanks for the feedback. I'll take a close look at Dsub. After wrestling with the Android file system and the Media Store I've finally managed to release Mono v2.81 which is now available on the Play Store. This version has the download/cache capability and individual tracks or whole playlists can be downloaded. The tracks are added to the media store so can be accessed as device files by Mono or other apps. There's also a download manager to delete downloaded files. To cancel downloads expand the download notification and select one of the cancel options. I tried to let the user choose the download location but that proved impossible with removable sd cards - the files are saved under the Android/media/com.mono directory. Appreciate any feedback you can provide.